Earlier on in the year all of you came together to help me out. I needed a powerchair so I could become more independent and start living my life again, chronic pain and a serious of life limiting health problems had meant walking was difficult and painful so a powerchair was a necessity for me. 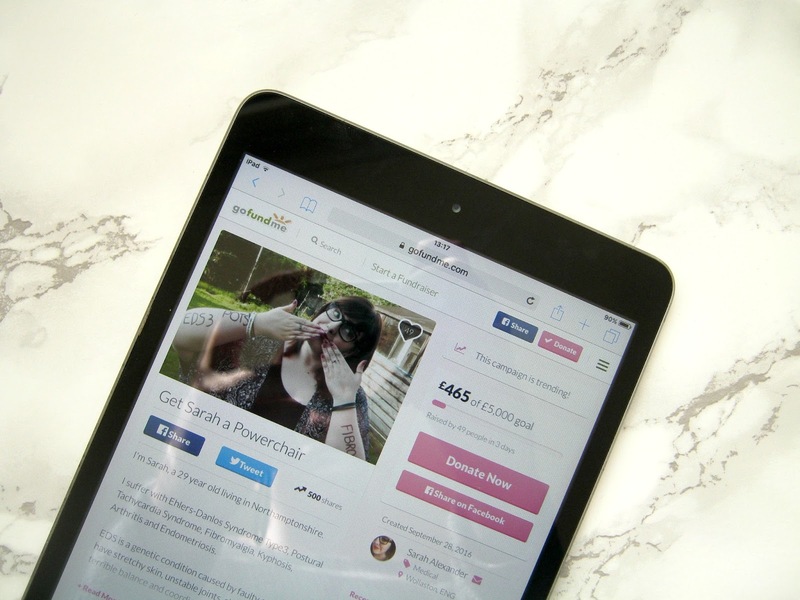 With the help of friends, family, bloggers and even strangers we managed to raise the £2,000 I needed and I've had my powerchair for a few months now, I can't even begin to explain how much it has changed my life. I need to ask you all a favour again though, however this time it isn't for me. My best blogging friend Sarah, from Sarah in Wonderland, has a condition called Ehlers Danlos Syndrome (type 3/hypermobility type), a condition that shares some similarities with mine in that it has causes severe chronic pain, joint hypermobility leading to painful dislocations as well as a long list of other problems. She also has a condition called Postural Orthostatic Tachycardia Syndrome (PoTs) which causes Sarah to experience dizziness and light-headedness, horrible heart palpitations, headaches, brain fog, fatigue and the inability to control her temperature. As Sarah puts it, in short she is basically in a lot of pain all the time whilst also feeling like she is going to faint. This means that like me she requires a powerchair, unfortunately though her current one isn't right for her anymore. It's too basic and whilst it can get her from A to B it doesn't do so comfortably. Sarah has had the same struggles with the NHS Wheelchair Services that I have had as well, due to extremely strict guidelines in her area they aren't able to provide her with anything and being disabled often means that you don't have a few grand sitting in the bank to buy your own chair. So, this is where the little favour comes in. Sarah has set up a GoFundMe and is doing really well so far, as I type this she is so close to reaching £500. 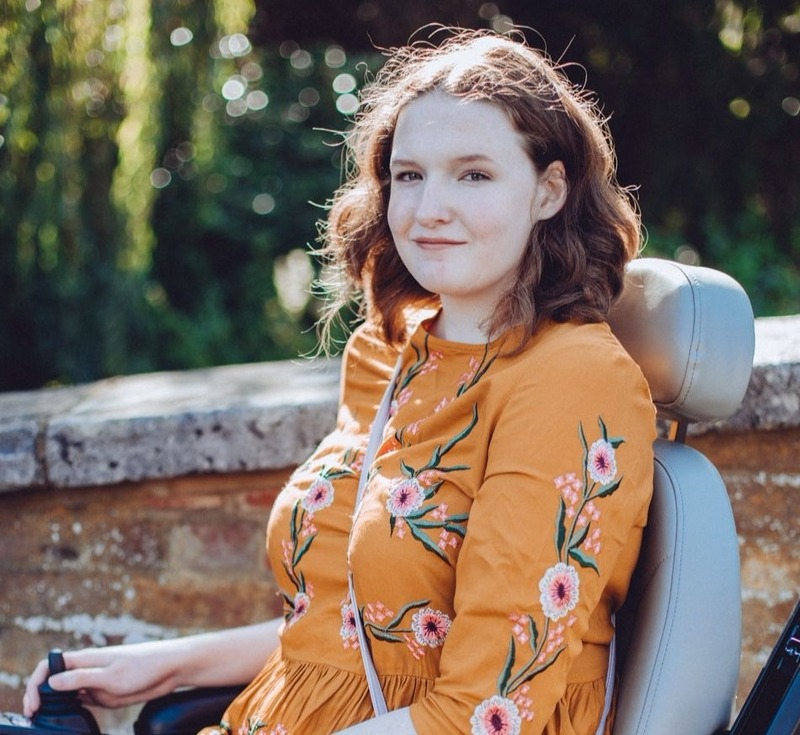 She needs £5,000 though to get the perfect chair for her, one that has a comfy seat and headrest to help control her pain and it's important for it to have a tilt and recline function to help ease her PoTs symptoms too, infact she has been told by her consultants that it is absolutely necessary that her new powerchair has such functions. I know myself how much of a difference people can make when they come together so I'm hoping you'll be able to do what you did for me, for Sarah. She isn't asking for much, if you can only donate a pound then she will be so incredibly grateful for that pound. Most of us are able to spare a few pounds for such an important and vital thing I think. If you really aren't able to donate though, that's okay, I ask that you instead share or RT her GoFundMe link, the pinned tweet on her twitter profile would be the best to share, you never know who could see it! This really will only take a few seconds of your time. I know what it is liked to be trapped in my own home, not being able to go out comfortably or independently so I don't want my best friend to be in this position any longer than she has to be, please donate anything you can. Thank you.